The junior game MVPs. 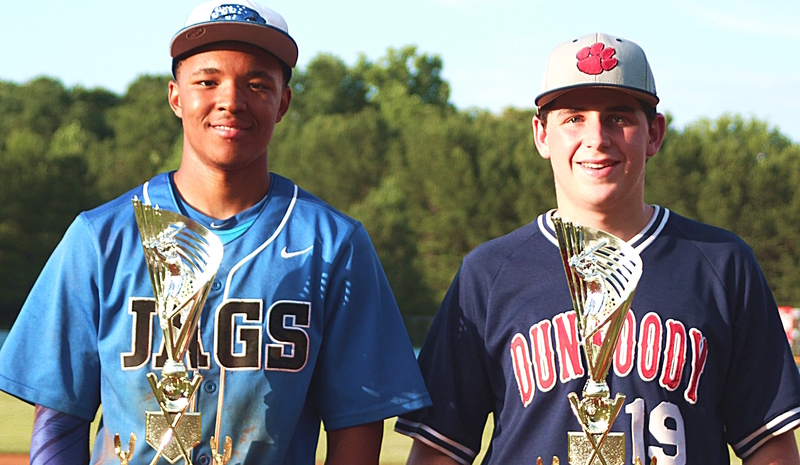 Courtesy of DeKalb Co.
Tuesday night marked the 10th annual Dekalb County School District All-Star Baseball Classic. The event brings together some of the best juniors and seniors from the county in a game that celebrates all of their accomplishments from the past season. The games were closely contested, with both games being decided by only one run. In the junior matchup, the West All-Stars defeated the East All-Stars in a thrilling 8-7 game. The West jumped out to a 7-2 lead after seven innings led by Dunwoody’s Jack Caiaccio who put together a record setting performance on the mound. Caiaccio entered the game in the fourth inning when his team was losing 2-1 and absolutely dominated the East hitters. He struck out 10 batters, an all star game record, before unraveling a bit in the 8th inning and allowing four runs. Caiaccio recorded no walks as well and was awarded the West MVP. The East All-Stars made their push in the 8th inning led by a two run double from Tyson Scott of Arabia Mountain, but the rally was not enough as Decatur’s Tucker Jones entered the game in the 9th and recorded the save. 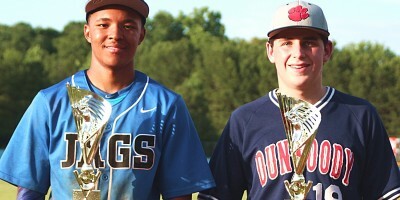 For the East All-Stars, Ga’Von Wray received the MVP after a 2-3 performance from the plate where he recorded a triple, a double and 2 RBIs. Wray also pitched two innings to start the game and recorded five strikeouts. In the senior matchup, the West all-stars defeated the East All-Stars 12-11 in a game that saw the West climb all the way back from a 9-1 deficit. To start the fifth inning, the West trailed 9-1, but scored six runs to bring the game within two runs. Heading into the 8th inning, the score was tied at 11, following a strong 7th inning the West. Team MVP Norman Kelly led the West’s comeback. Kelly put together a 2-4 day at the plate with two doubles, four RBIs, three stolen bases and a walk-off sacrifice fly. Some other strong performers from the game included Druid Hills’ pitcher Mason Curtis who put together a nine strikeout performance on the mound, setting a new senior all-star game record. Arabia Mountain’s Corey King also dominated on the mound, allowing no hits and recording seven strikeouts.